All transactions are safe and secure with a reliable history in online purchasing behind each of our associates. 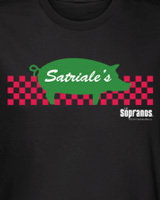 Buy the Sopranos Satriale's Meat Market t-shirt to own Sopranos clothing and merchandise. The fronts of these Sopranos t-shirts feature a stylish logo for Satriale's Meat Market. The fictional pork store and meat market is a popular hangout for Tony and his friends on The Sopranos TV show. Help to promote this family run store. This bestselling Sopranos t-shirt is a great way to convey your love for the HBO TV series. In addition to the Sopranos Satriale's Meat Market tee above, browse the Sopranos Clothing Gallery for more apparel like men's and women's clothes, kids shirts or hoodies.